Today I had to make one of the most painful decisions of my life. 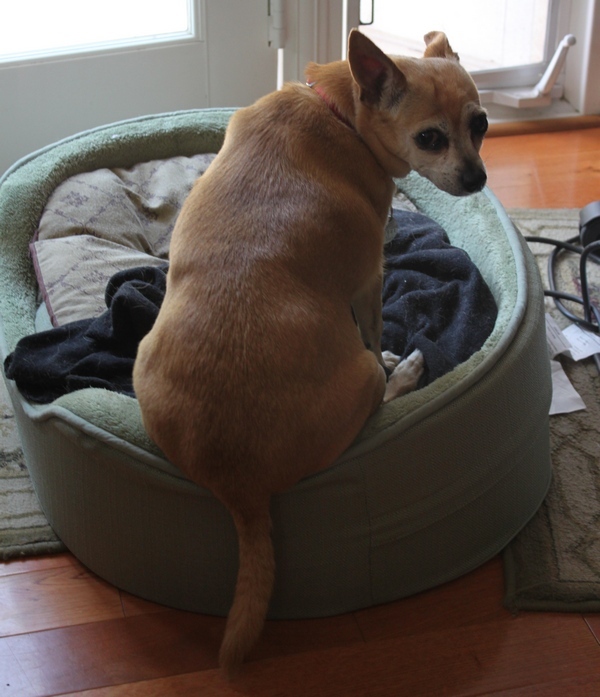 I had to say goodbye to my dog Chacha. This is the first time I’ve had to experience making such a decision and I was honestly hoping that it wasn’t ever going to come down to me. This morning my Wife Esther knew something was wrong when she filled Chacha’s food bowl and she didn’t excitedly come running to eat. Eating had become the only excited moment of her day in recent weeks. She went looking for her and found her in our closet looking into a mirror and disoriented. She was also breathing with noticeable effort. I grabbed her bed and put it in my office. I then lay her there and spent time petting and trying to comfort her as she continued to breathe heavy as she lay fairly still and falling in and out of sleep. I had lunch in the kitchen and when I went back to my office I didn’t see her. I called her name but couldn’t find her. I then heard the noise of her collar coming from my daughter’s room and found her again disoriented and under her bed standing breathing hard. I called the vet and had an appointment to bring her in. Esther had already sensed that today may be the day and she communicated that to me. I was already feeling some denial but every time I looked at her she didn’t look good and never wagged her tail in content as she often would. About a year ago she started to have infrequent seizures. Six months ago she had 3 within a 24 hour period and I had to take her to the hospital and leave her overnight. I felt really awful to see her that way but luckily they were able to nurse her back and put her on several medications. The doctor actually told us she had about another 7 months left to live. After we got her home she felt better and didn’t have seizures but the medicine was definitely taking a toll on her. Over the last several weeks we started to see her deteriorate. She looked to be in pain and we started to worry. As I prepared to go to the Vet today I had my kids come over and spend a little time with her and told them that it may be the last time they see her. Not an easy thing to tell your kids but I wanted to be honest and give them a chance to say goodbye. I then picked her up and drover her to the Vet. Esther met me there and we explained to the doctor everything that had transpired over the day. He examined her and agreed that she was struggling and then gave us several options. We had to decide whether to leave her overnight and put her through more tests or treatment which seemed to only be delaying the inevitable, or put her down. The doctor left the room and Esther and I talked and cried and I was questioning whether it was time, and Esther kept reminding me how bad she’s been. The doctor came back in the room and we talked to him some more. I asked if he felt it was her time and he was very nice and let me know he’s seen many families choose to put their animal down too soon and others wait too long and he felt that now was the right time for Chacha. He left the room again to give us more time and that’s when Esther and I said our goodbye’s and broke down. After some time the nurse came back and asked if we were ready I gave her one last hug and kiss and then walked out of the room. Mark, sorry for your loss. We understand 100% and went through the same trials in 2008 when we lost our 18 1/2 year old beagle Molly. Of course, weeks later, we had twins, so maybe that is what is in store for you as well! Take care. My sympathies for your loss, Mark. It could not have been an easy decision. Thanks Mo & Louis. Your thoughts are appreciated. Oh…I’m so sorry. I had 2 little sisters named Daisy and Peanut that looked almost identical to your Chacha. 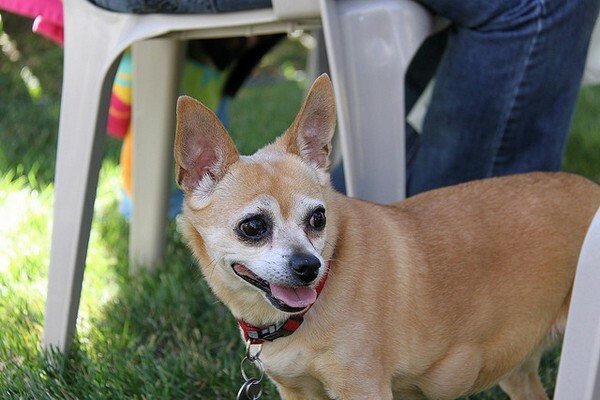 Peanut was gone by her 9th birthday from Cushings disease. Her sister Daisy lasted until 14 years old but the pain was the same when she finally passed away. You made the right decision to have her put to sleep. I made that decision with all of my dogs and held them when it happened so they had no fear. With Daisy though I didn’t have that luxury as she died at home….a terrible way to go. I was sorry that I didn’t make the decision to get dressed and take her to the emergency care in the middle of the night…it will probably always haunt me. Believe me, you did the right thing…the kind thing.